Current requirements: The second thing to figure out is how much current your motor will need. 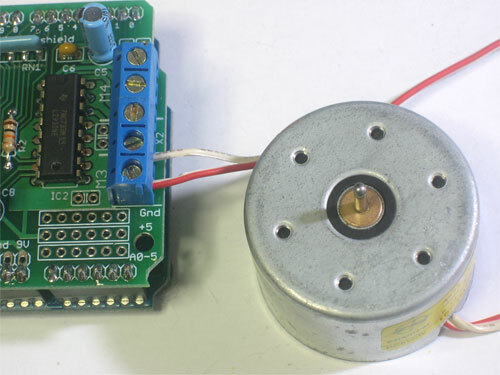 The motor driver chips that come with the kit are designed to provide up to 600 mA per motor, with 1.2A peak current. If you need more current you can 'double up' the motor (connect your motor to two ports at once) for 1.2A per motor, 2.4A peak. Note that once you head towards 1A you'll probably want to put a heatsink on the motor driver, otherwise you will get thermal failure, possibly burning out the chip. Need more power? Buy another set of L293D drivers and solder them right on top of the ones on the board (piggyback). Voila, double the current capability! 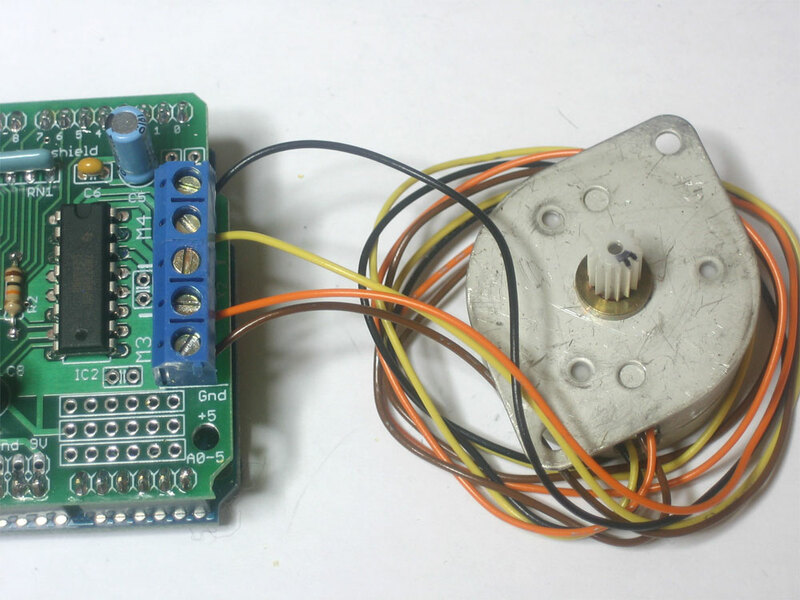 Hobby servos are the easiest way to get going with motor control. They have a 3-pin 0.1" female header connection with +5V, ground and signal inputs. The motor shield simply brings out the 16bit PWM output lines to 2 3-pin headers so that its easy to plug in and go. They can take a lot of power so a 9V battery wont last more than a few minutes! Finally, when you want to set the position of the servo, simply use write(ANGLE) where ANGLE ranges from 0 to 180. 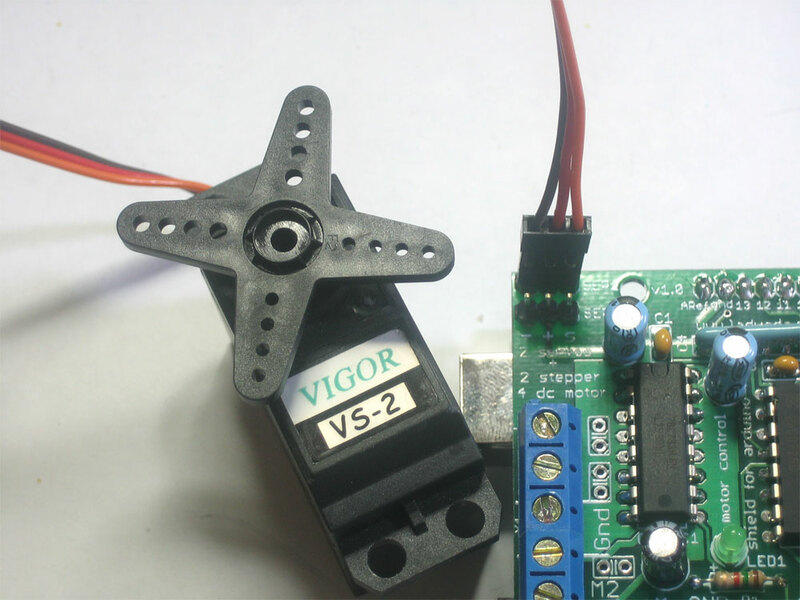 90 is "dead center" for position-servos and "not moving" for continuous-rotation servos. DC motors are used for all sort of robotic projects. 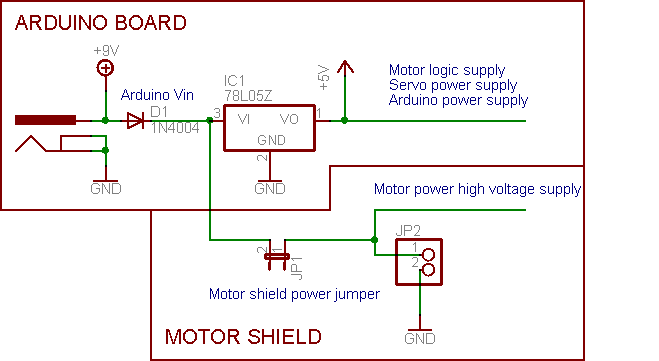 The motor shield can drive up to 4 DC motors bi-directionally. That means they can be driven forwards and backwards. The speed can also be varied at 0.5% increments using the high-quality built in PWM. This means the speed is very smooth and won't vary! Note that the H-bridge chip is not really meant for driving loads over 0.6A or that peak over 1.2A so this is for small motors. Check the datasheet for information about the motor to verify its OK.
Then every time you want the motor to move, call the step(#steps, direction, steptype) procedure. #steps is how many steps you'd like it to take. 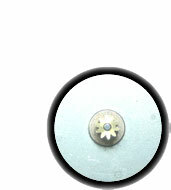 direction is either FORWARD or BACKWARD and the step type is SINGLE, DOUBLE. INTERLEAVE or MICROSTEP.